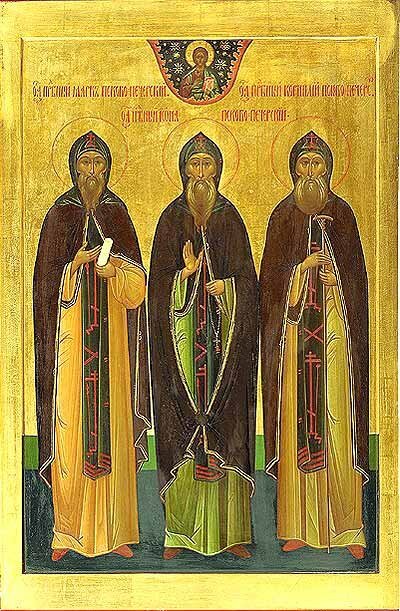 The Monastics Mark, Jona and Vassa are venerated as among the originating fathers of the Pskovo-Pechersk monastery. It is unknown precisely, when the first hermit monks settled by the Kamenets stream in the natural caves of the hill, which the local inhabitants called "the holy hill". The monastery chronicle presents an account of eye-witnesses, hunter-trappers from Izborsk by the nickname of Selishi: "Once by chance we came with our father to the outlying hill, where now is the church of the Mother of God, and heard what seemed church singing; they sang harmoniously and reverently, but the singers could not be seen, and the air was filled with the fragrance of incense". Of the first elders of the Pskovo-Pechersk monastery only Mark alone is known by name. About him it testifies: "First at the beginning a certain elder was living at the Kamenets floodage by the cave, of whom certain fishermen caught sight of at the three rocks, lying over the cave of the MostHoly Mother of God church; but we were not able to discover anything known about this one, – who the elder was nor his lineage, nor how and from whence he came to this place, nor how long he dwelt there nor how he died". The second hegumen of the Pechersk monastery bore the name of Starets (elder) Mark in the monastery Synodikon. The Monk Kornilii (Comm. 20 February) as hegumen doubted the veracity of this inscription and he ordered that the name be erased from the Synodikon. Suddenly he became grievously ill and had a revelation, that this was in punishment for ordering to strike out the name of the Monk Mark from the monastery diptych. Begging forgiveness with tearful prayer at the grave of the Starets Mark, Hegumen Kornilii put back his holy name. When the cave church of the Uspenie (Dormition) of the MostHoly Mother of God was dug out and the burial caves expanded, the Hegumen Dorophei found the grave of the Monk Mark in decay, but his relics and clothing undecayed. In the year 1472 the peasant Ivan Dement'ev cut down the forest on the steep hill. One of the felled trees rolled downhill, tearing out of the ground by its roots another tree. The slide opened up the entrance to a cave, over which was the inscription: "A cave built by God". (There is a tradition about this, that a certain fool-for-Christ the Monk Varlaam frequently came to the cave and wiped away this inscription, but that it every time miraculously re-appeared). To this holy spot, prayed in by the first ascetics, there came from elsewhere the priest John nicknamed "Shestnik". He was a native of "the Moscow lands" and served as priest at Iur'ev (now Tartu) in "a right-believing church, established by Pskov people" and named for Saint Nicholas and the GreatMartyr George, and he together with the Priest Isidor spiritually nourished the Russians living there. In 1470 Father John was compelled to flee with his family to Pskov under persecution from the German-Catholics. Having learned of the martyr's end of his comrade (the commemoration of PriestMartyr Isidor is 8 January), John decided to withdraw into the newly-appeared "cave built by God", so that there, on the very boundary with the Livonians, he might found a monastery as an outpost of Orthodoxy. Soon his wife fell ill and, having taken monastic vows with the name Vassa, she died. Her righteousness was evidenced immediately after her death. Her husband and her spiritual father buried the Nun Vassa in the wall of "the cave built by God", but by night her coffin was "removed from the ground by an invisible power of God". Father John and the other priest confessor of the Nun Vassa were upset, thinking that this had occurred, because they had not made in full the order of farewell-song, and a second time they sang the funeral service and again they buried the body, but in the morning it again was "atop the ground". Then it became clear, that this – was a sign from God. They made the grave of the Nun Vassa in the cave on the left side. Shaken by the miracle, John took monastic vows with the name Jona and began to asceticise even more fervently. Having dug out by hand the cave church and two cells on pillars, he began to petition the clergy of the Pskovsk Trinity cathedral to consecrate it, but these decided not to do so at the moment "because of the unusual location". Then the Monk Jona besought the blessing of the Novgorod Archbishop Theophil. On 15 August 1473 the cave church was consecrated in honour of the Uspenie (Dormition) of the MostHoly Mother of God. During the consecration there occurred a miracle from an icon of the Uspenie of the MostHoly Mother of God – a blind woman received her sight – "sent by the merciful God beginning His great gifts to His All-Pure Mother". (This icon, which they call the "old", in distinction from another wonderworking icon of the Uspenie of the MostHoly Mother of God bordered with Her life, was written about the year 1421 by the Pskov iconographer Aleksei Maly, and is preserved at present in the altar of the Uspensk temple in the hill locale. The icon bordered with the life – is the temple patron-icon of the cave church). The date of consecration of the cave church is reckoned as the official date of the founding of the Pskovo-Pechersk monastery. The Monk Jona asceticised at the cave monastery until 1480 and peacefully expired to the Lord. Upon his death they discovered on his body a chainmail coat of armour, which was hung over his grave in testimony of the secret ascetic deeds of the monk, but during an incursion of the Germans it was stolen. The relics of the Monk Jona rest in the caves alongside the relics of the monastic elder Mark and the Nun Vassa. Once during an invasion of the monastery the Livonian knights, jeering over the holy relics, wanted to open with a sword the cover of the coffin of the Nun Vassa, but a flame from the holy ascetic flashed out from the coffin. Traces of this punishing fire are seen to the present day on the coffin of the Nun Vassa.